Some children are so full of natural grace that even a pudgy mystical gift giver can’t distract them from Jesus. But normal kids — kids that are closer to how I was as a child — will find their allegiances split. I can’t believe that I’m the first 5 year old who impatiently sat through church on Christmas Eve, ignoring all of the stuff about nativities and wise men; entirely engrossed in visions of reindeer, elves, Santa Claus, and Game Boys (it was the 90’s, kids). 740 Responses to Who needs Santa when you’ve got Jesus? I just find is sad that you write a post that is pretty much a killjoy type of posts. If parents want to partake in the Santa thing, that is their choice. It’s not a lie so much as playing pretend with your kids. If you go to Disney, would you tell your kid who is all excited to see Micky Mouse that he isn’t real.. and it’s really just a person in a suit? Of course not. Why? Because it’s nice to let your kids believe. It’s not a lie. It’s just playing make believe. I enjoyed that my mother taught me about Santa. When I found out he wasn’t real, I wasn’t mad. I was happy she partook in something that even though wasn’t true, was fun to pretend it was just for me. The challenge here is that you are under the pressure of making your kids believe in faith. Which is no more or less different then trying to get them to believe in Santa. You can’t prove for a fact that God is real any more then you can that Santa was. So if you pretend Santa was and they find out he isn’t, then they will question other things you have told them. Like God. Think about that. You have to defend the being of something that you can no more or less prove to be any more real as Santa. Christmas has changed into a Holiday celebrated by all types of people who may or may not believe in Jesus. They are no less guilty for adopting some of these things, then Christians are for adopted the pagan parts of the holidays into Christmas. Do you even have children? Even my two year old is not dumb enough to think that the costumed Mickey Mouse is real. Of COURSE they know it’s a man in a suit. And it’s fine and fun to pretend, but you are seriously underestimating the intelligence of children with that statement. My children have active imaginations. The other day they were playing “Frozen Tiger Daddies,” whatever that was (I have no idea). And I didn’t tell them “Don’t be silly boys, there is no such thing as a Frozen Tiger Daddy. I laughed at their game and encouraged them to keep enjoying their playtime. But part of my job as a parent is to help my children differentiate between make-believe and reality. Lying to them about Christmas doesn’t help me accomplish that. Santa isn’t evil – my boys even enjoy “playing” Santa sometimes, but they know it’s a game. And trust me, it doesn’t make them any less thrilled about Christmas morning. For the record, I grew up not believing either, but Christmas was (and probably still is) my favourite day of the year. Actually, when we went to Disney my mom made sure we understood that everything around us was fake and only Jesus was real. As a child I appreciated that because I knew she wasn’t lying to me about anything or perpetuating the lie that was trying to be sold to me. this is how I raised our sons ..to know Truth .. I am sure you appreciated your mother’s wisdom & grace. Jesus is not real too. He is Santa for silly adults. “It’s not a lie so much as playing pretend with your kids.” Well, Kay, THAT is a lie. When you play pretend with your kids, they know you’re pretending. Parents do not say, “Let’s pretend Santa is real.” They LIE to their children and TELL them that Santa is real. If you can’t see the difference, then you are blind. Replace ‘Santa’ with ‘Jesus’ and you get the same result….a lie! Thanks, Scrooge! Would you mind also reading this perspective Matt? “Certainly, Santa Claus is far more pleasant than the Bogeyman, but I submit that they are both relics of a time when it was acceptable to coerce your children with mystical scare tactics. LOL, I feel the same way about your absurd religion! “Be good and believe in Jesus, accept him as your personal savior or go to hell”? Same scare tactics, same level of evidence. Listen, I don’t really care if people feel the need to believe in this Christian mythology but I think if we are willing to tolerate your absurdities you could show a little more tolerance toward other people’s absurdities. OH WAIT, your religion doesn’t believe in tolerance…. I appreciate the tolerant and accepting tone of this comment. Er… never mind. It’s only a scare tactic if it’s not true. So, it’s a scare tactic. Jesus ain’t real, and ain’t gonna come and punish me for anything. Your religion is not just false but dangerously insane ideas. It’s followers are horrible people. All of them. I have never met a “good” christian. You’re right. Christians aren’t good. We’re horrible sinners just like you. The only difference we repent and know our sins are forgiven by the grace of God. Santa is not a lie. It is based on Saint Nicholas who is legit. My kid believed in Santa, heck I still believe in Santa because it’s not a person but a spirit of giving. Which by the way is a Christ like spirit! We do Santa, we know it’s about Jesus and we understand that Santa is just a fun way of sharing a Christ like love and attitude with our families and friends. I am Santa, my son loves that he can be Santa now. My parents enjoyed being Santa as well. We are all real. The spirit of St. Nick is real. My husband passed away 2 years ago and we still give gifts in his name as well. Doe sthat take away from Christ? Is it a lie because he isn’t physically here giving us gifts? Nope, it’s just a simple way of carrying on his love for us and the season. My seminary teacher taught us that Santa is not bad, off of a real man who had such a Christ like spirit that he was named a saint. When my son became old enough to understand, I explained to him that it’s not that Santa is not real, it’s that we continue to give through him, so we all become Santa. Just like gifts were brought to Jesus. It’s out of love, and christ like hope and faith. We also have a box under the tree, wrapped in white that we add pieces of paper in it. On each piece of paper is our gift to Christ. When he do something kind, stand up for what is right, and try our hardest, we write it down and give it as a gift to Christ. I don’t know what tainted the spirit of Santa for you but I hope you still are able to feel that beautiful spirit of giving, and love during this Christmas season. I believe in Christ and I believe he loves us. I believe he also loves when we share with other’s not just gifts, but time, and patience. I believe that Christ would only love St. Nick and the giving spirit he brings each year. I do hope you have a Merry Christmas. I have thought about this and will continue to. I know it sounds bad but it isn’t the lie that makes me want to stop doing Santa, although I’m not a big fan of it, but it does seem that there is not enough room for 2. I have 3 small kids and they talk about santa constantly and Christ gets all but forgotten. I have been trying to think of ways to keep both but it seems I am trying to sneek Christ into Santas holiday and that is totally backwards. So THANK YOU for giving me more motivation to put the spotlight on the right person even if that means getting rid of the jolly fat one. Love, love, love this. You so describe how I feel about it! We don’t do Santa and honestly I can not imagine adding him in to this already hectic crazy time of year. Like you said, there just isn’t time for both Jesus and Santa and if you are focused on one the other one fades into the background. And I am so so so glad that I can honestly say I’ve never told my kids a lie. And in most cases, it’s not just telling them a lie- it’s doing very elaborate crazy things to convince them the lie is true. I just don’t understand it. My kids get just as excited about Christmas as every other kid and no magic is lost by not having Santa. Most little kids are terrified of him anyway. And my older children are at the age where their friends are finding out, and quite honestly most of them feel pretty dumb that they believed and confused that their parents told them he was real. If you can’t do Christmas without him then by all means, continue on. I’m glad we don’t. I’m with you on this one. I don’t ever remember believing in Santa Claus, but Christmas has still been a magical holiday for me, and my favorite one. I don’t talk about Santa with my own kids, and when they ask, I tell them the truth. But they still love Christmas. It’s of little concern to me if other people celebrate Christ’s birth through a surrogate because they don’t stop me from celebrating the holiday the way i want to. Sometimes, though, it’s the Christians with whom I clash the most on this issue. What bothers me is when my friends and associates who are Christian cast me as the bad guy when I tell my children the truth. Seriously, when my five year old son was in children’s Sunday School and Santa was brought up (I have no idea why they would even talk about Santa Claus during Sunday School, but…), he shared the truth with them. Or, at least, started to. He was quickly hushed, and I was later reproached for not having warned him that other parents want their kids to believe in Santa and it is not okay for him to tell the truth. Well, I want my kids to believe in God, but I don’t follow my kids around warning all their friends and associates not to tell them otherwise. And I know that my children will encounter myriads of people throughout their lives who do not have the same religious beliefs they do. That’s okay. For Muslims or Buddhists or atheists to focus on Santa Claus more than Christ during Christmas (although why do they celebrat Christmas at all?) is none of my business. But for Christians…? When we run into strangers in the community who ask my children what they want Santa to bring them for Christmas, they say Santa Claus isn’t real. And I follow it up with letting them know that we believe in Christ, not Santa. I can’t think of anyone who has ever had a response to that statement. My take on this isn’t the same, but here are my thoughts on making Christ a part of your Christmas Celebration: http://www.ruminatingroom.com/2013/12/an-invitation.html. When my kids were little we watched all the Santa Christmas shows and talked about Santa coming etc…at the same time we were doing this I would say, “But Santa isn’t real he is pretend. Isn’t it fun to pretend. Santa stories are so fun to pretend!” And never made a big deal about it. We would go to Christmas Eve service or have discussions while decorating the tree and talk about the Real Jesus and the Nativity Christmas story that was true. Again not harping, just celebrating and experiencing the holiday…both the real and the pretend parts. (I think your tone is a bit militant. We don’t have to lie…but we don’t have to get rid of Santa either – relax and celebrate what is real and have fun with the pretend – one doesn’t have to take away from the other…because they are different from one another). Why are we picking on poor Santa? The Elf on the Shelf is MUCH creepier, in my humble opinion. Far as I’m concerned, Jesus is just as much of a myth. Besides, Christmas in December was usurped from pagan religions. I celebrate a secular Christmas, and Santa is welcome in our home. Jesus is a myth? He is a historical figure! Just because you don’t want Him to exist doesn’t change that He came. By that logic, I submit that you are a myth. Perhaps I worded that incorrectly, I apologize. 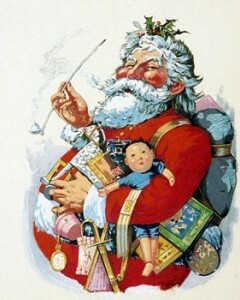 Santa, “St.Nicolas” was a historical figure who grew into a mythology. I view Jesus the same way-sure, he was probably a real human being, but the mythology just grew from there. If someone showed up *now* and claimed they were Jesus returned to earth, and did some cool magic tricks, would you believe it was him? How would you know? What would be your proof, because you would probably need proof that it was him, otherwise, you are taking it on complete faith that what he claimed was true. And since it’s a matter of faith, how come you require no proof that someone is Jesus before you believe in him? I submit that all religions are invented by mankind, and perhaps there is truth in some of them, I don’t know. But I personally don’t believe there is a deity out there, and that mankind is on our own. Besides, the Christian god is supposedly omnipotent, yet look at all the suffering in this world. If that’s the kind of god he/she is, then I don’t *want* to worship such a creature, even if such a thing *did* exist. And since I don’t believe in the concept of hell, or the devil, then I’m not too worried about the consequences of non-belief. To each their own though. I’m good with celebrating Christmas with Santa. Your idea of what God should exist for is a presupposition that he exits to prevent the human experience which, let’s be real, often times, entails an enormous amount of pain and suffering. I’ve heard that same argument from Richard Dawkins and find it strange that atheists expect that, if we were created by a deity, we wouldn’t have cancer or any ailments. How do people come up with these expectations of what a god should be? I’m amused by it. It seems very simplistic and naive. Oh, and I celebrate Christmas with Santa and Christ. We know that we’re celebrating on the wrong date for Christ’s birthday anyway, but it’s fun to join in a cultural tradition that encourages generosity and love for our neighbors. We enjoy the story of St. Nicholas also. He was believed to be a champion for Christians and that is something to celebrate! If you don’t “do Santa” with your own kids, that’s fine. Why do you care, though, if other families do? To each his own. Me and my siblings grew up believing in Santa, and my oldest daughter also grew up believing in Santa, but my baby now who is four I dare to bring her up in the myth of Santa. I do not condemn anyone who let their children believe in Santa, but I have learned better. I rather live here on earth as if there is a God in Heaven, then to die and go to heaven and see that there really is a God. Children need to know the truth about what Christmas really mean, and it is not about getting but it is about giving. Giving the truth gift and that gift is Love, As I said I do not condemn anyone who wants to bring their children up believing in there is a Santa, but for me and my child we will believe in God. I was thinking much the same, but I am in my 40’s so not an age thing. I believed in Santa, and don’t have any idea when that changed. I called my mom after reading this and asked if we ever had this talk because I don’t remember ever caring. She said as I grew older, a school mate or cousin probably told me but I never asked. I still believe in God, never assumed they were hand in hand, and have had eight children, six who never questioned or were upset, just eventually figured it out. I have just found your blog, Matt, and am LOVING what I have read so far. After reading this post I had to comment. . . One of my dear friends and one of the wisest women I know (she is in her late 70’s) has this to say about the subject: Materialism is the religion of America and Santa is the God whom we worship. He comes down from the sky every year to give us the things we ask him for. We bring our children to pay him homage at the place of worship we call the Mall, where we can meet him and ask him for the things we need, and then give a sacrifice at the alters therein to receive those things, aka pay money for stuff at the stores in the mall. We try to be good because he is always watching, etc. etc. etc. This all came up because I asked her a couple of years ago what her opinion is on Santa and Christmas. I have three young children and was feeling funny about spending so much time teaching them about Santa instead of Jesus. She gave the above analogy, and then told me her opinion became cemented that Santa could be a “fun” part of Christmas but not passed off as truth when, while her own children were young and she was teaching a Sunday school class to a group of 8 or 9 year-olds, one girl told her, “When I found out Santa wasn’t real, I thought Jesus must not be real either.” She decided then to be a place of truth for her children, where they could ask and be told the truth as she understood it without reserve. Wise woman. I am trying to model my life in that way. Thank you for your blog. You are spreading truths. In my religion, we believe that truth is “things as they really are.” I appreciate your posts about things as they really are. Truth makes people mad. It always has and always will. Nice job standing for truth! Wonderful comment. My grandpa’s trust for his parents was obliterated when he was told Santa wasn’t real (the elf/fairy tale). He lost much of his trust for his parents because he didn’t know, at that point, what was fact and fiction that came from their mouths. As you’ve pointed out, a child can lose their faith in Jesus Christ if they are being lied to about something else. Obviously, children are not all the same. Some will be fine if they find out Santa isn’t a flying elf, etc., but some might have their trust and faith in their parents’ truthfulness destroyed. To me, having my child trust me and what I have to teach him about Christ is far more important than an annual fantasy game. It’s not worth the risk! You just vitiated everything you said about the lie of Santa. When parents lie about Santa, it is deliberate, premeditated, habitual, unrepentant deception — against their own children. We are not talking about someone who falls on the spur of the moment into the sin of lying and repents of and hates that sin. We are talking about those who carefully plan the sin and love walking in the sin. The Bible calls these people liars. And no liar will inherit the kingdom of heaven. Not “doing” Santa doesn’t mean throwing out all tradition, it can mean creating new traditions or dredging up old traditions that align with our faith more than a materialistic jolly magical man. Well written. I wrote similarly recently, and love the distinction you drew between Santa the fantasy and Santa the “real, live person”. I actually took a different approach to the topic than you did, but we landed in the same place: the story is complete, beautiful, redeeming enough without anything added. Hmmm…. Both St. Nicholas and Jesus were real people whose lives inspired stories and traditions in Western culture. How can you say–using your own logic–that one is real and the other is not? The Jesus story has no end either. Saint Nicholas was an actual human being. There is not one shred of evidence that Jesus ever existed. So, Santa is real, at least the story version, and Jesus is not. Matt – hope life after radio is treating you well. Even though you’re not doing it anymore, hope it’s okay to still consider you a fellow broadcaster. Truth does matter. Amen Matt. But as is often discussed on this blog, so does consistency. You can’t say one falsehood is wrong while condoning another as okay. The angels announcing His birth are real. The “no room in the inn” is most likely “no room in Joseph’s relative’s/friend’s upper (guest) room that he stayed at because it was the culture to visit family and friends/an insult not to, so they had to make do with the lower portion of the house where the animals come in at night and there was a manger (trough) in the floor.” But something like it did happen. But Jesus being born on Dec 25th? The use of all the pagan symbols to celebrate it (ones that were used to celebrate pagan rituals before they were combined with the birth of Jesus to make a bigger celebration)? More of man’s tradition. Which Jesus was pretty clear about us not following instead of the commands of God. Like observing the Feast of Tabernacles, an appointed time God actually instructed “His people” (defined by scripture as those who know and walk with Jesus) to observe. A biblical feast that has not been fulfilled yet. And may very well be when Jesus was born. But the Bible doesn’t tell us. Maybe because the date was irrelevant. Maybe God knew that we would make it about “a day” instead of what it was about. Guess what? We came up with a day anyway. Rather than keeping Christ in Christmas, man put Christ in Christmas. And even most of the activities surrounding what we do have little to do with Him anyway. We can tell stories about how they “represent” something Jesus-y. But that’s just more myth-telling. IMHO Christians actually do as much, if not more, damage to the real story by promoting it as we do in promoting Santa. Because it’s not the real story. And the reason my children, while knowing about the “story” of Christmas, actually know the truth of Jesus’ birth. Compared to Matt, this isn’t much of a rant. But like Matt, I agree with being as consistent and truthful as possible. Matt, thanks for letting me take up a little of your blog space. Peace. As a little kid I never believed in Santa, and I never felt compromised. It helped me to appreciate my parents much more.